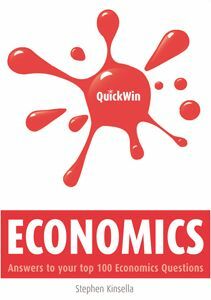 QUICK WIN ECONOMICS is aimed at practical people who understand that economics is important, because economic models inform the most powerful people in the world, who make decisions based on the advice of economists. Those decisions affect the daily lives of millions of people, for better and for worse. The mistakes of economists can have serious consequences. It pays to know what they are talking about. QUICK WIN ECONOMICS will help you decode economic phenomena – for example, you’ll find out exactly why a change in central bank lending rates will change your mortgage, making you richer, or poorer. You’ll find out what a stock is, and what a stock market index is. You’ll understand the basics of exchange rate movements, while avoiding jargon. You also can use the grid system in the contents section to search for questions and answers across a range of topics. And, where it’s appropriate, you’ll get cross-referenced answers to sources that can give you a fuller explanation, and take your reading further. QUICK WIN ECONOMICS is also available as an iPhone app. This new title is aimed at practical people who understand that economics is important because economic models inform the most powerful people in the world, who make decisions based on the advice of economists. Those decisions affect the daily lives of millions of people for better and for worse. The mistakes of economists can have serious consequences, so it pays to know what they are talking about. The Quick Win series is available in hard copy, in e-book format and as apps. All the books are quick guides for the businessman and student and deal with a variety of subjects concerned with business promotion and marketing. Oak Tree Press have hit on a winning formula by getting an expert, usually an academic, in some field of marketing to pose and answer 100 questions. The questions cover every aspect of the subject and the answers are straightforward and to the point. All the books are similar in layout and design, with the information arranged in boxes. The contents are clever in guiding the reader by themes as well as by topics.